Brandon is passionate about helping his clients in Brentwood and Santa Monica achieve their full potential. Through innovative exercise programs that incorporate strength training, flexibility, balance and coordination, Brandon continually changes the lives of everyone with whom he works. He has a B.Sc. in Kinesiology, and has received certifications from Z-Health, the National Academy of Sports Medicine, and the National Council of Certified Personal Trainers. Brandon is constantly striving to stay on the cutting edge of his field. He loves what he does, and it is evident in the energy and focus he brings to his personal training sessions, and in his ongoing commitment to the progress of each one of his clients. The true measure of fitness involves more than how much you can bench press, how fast you can run a mile and what your body fat percentage is currently. It's also measured in longevity (your ability to remain active for a lifetime) and functionality (how well you can do day to day tasks). Go into any gym and you'll find the cardo lovers pumping out the miles on the treadmill and the strength builders maxing out their reps with the free weights. What you won't see much of are two of the most vital components to your fitness and health...balance and coordination workouts. We often think that if we aren't sweating buckets or working to fatigue that our workouts just don't "count". We're so conditioned to believing the farther we can run and the more pull ups we can do then the fitter we become. But as Brandon, our Brentwood personal trainer knows, this is not necessarily so. Enhanced athletic performance: There's a reason football players run ladder exercises and it's not because there's an obstacle course on the playing field. Fine motor skills make for quick reflexes and lightness on their feet. They're able to out-maneuver their opponents and gain precious yards. Reduction in injuries: Balance exercises work stabilizing muscles effectively. This, in turn, improves posture, knee stabilization, ankle flexibility and core strength. For instance performing dumbbell squats on a Bosu ball engages many more muscles than performing them on solid ground. Managing complex movements with more body control: Managing your way through an obstacle course that combines motor skills (coordination) and balance will increase your reaction time while keeping your body movements finely tuned. This helps eliminate sloppy form that often end in injury or poor muscle development. Less risk of falling: As we age our tendency to fall increases, as does our risk of injury followed by a slow recovery. Of course, the more active we are through out the years the better our bone density and ability to 'bounce back'. By including balance and coordination exercises, like yoga poses, the more likely we are to be able to catch ourselves and prevent the fall in the first place. 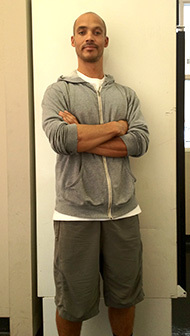 Brandon works on all aspects of fitness; strength, cardio, flexibility, balance and coordination. Your workouts will never be boring, you will create more biomechanical efficiency and your day to day activities will become easier to manage. No matter what your personal fitness goals are they can all benefit greatly with proper training. For more information about what we have to offer to help improve your life now and well into the future contact us today. Note: Jesse was not an MMA fighter when he signed up with us. He got in peak shape training with Brandon and then went into competitive MMA fighting. I would like to take this opportunity to recommend Brandon who is a professional and dedicated personal trainer. Prior to training with Brandon, I was training with another personal trainer who was moving and no longer able to train me. I asked the trainer of all the trainers in the gym who should I look at, without hesitation the trainer pointed to Brandon and said… “Brandon, he’s solid from head to toe.” That was in 2008, it’s been three years and I haven’t regretted one workout with Brandon. I watched Brandon for a number of months before I hired him. He was one of the very few trainers at my gym that appeared to know what he was doing, and he took the time to interact well with his trainees. The other trainers seemed to always be on their phones or talking to third parties. It was a smart move on my part. Brandon is the first trainer I have used (and I have used a few), who has gotten substantial results without killing me. In four months I have gone from 226 to 204 pounds, and I do NOT feel pushed beyond my abilities. I am not in pain after a session. And I am 60 years old. Brandon is also very knowledgeable about movement, stretching, flexibility, nutrition and diet. His skills have overcome my laziness. He is probably the best investment that I have made in my health and well-being. I thought that I didn’t need a trainer. Boy, was I wrong! Working with Brandon returned my physical health and flexibility to a level that I thought was long gone. As a result, I now recommend him to all my patients who are seeking an improved level of wellness. He has a global approach that incorporates nutrition, strength, and flexibility. Wm.